The Bombay Cocktail is an obscure bit of greatness from Harry Craddock’s 1930 Savoy Cocktail Book . If anise or absinthe is part of your palate, if the Sazerac or the Corpse Reviver are on your regular list of suspects, then spend some time with the Bombay. In the Savoy , the drink is officially known as the “Bombay Cocktail (No. 2).” * Craddock’s original recipe matches brandy with a hefty dose of vermouth and a very light seasoning of curaçao and absinthe. He’s heavy-handed with the vermouth—equal parts of brandy and combined vermouths. I like vermouth as much as the next guy, but this is the wrong place to put it up front. 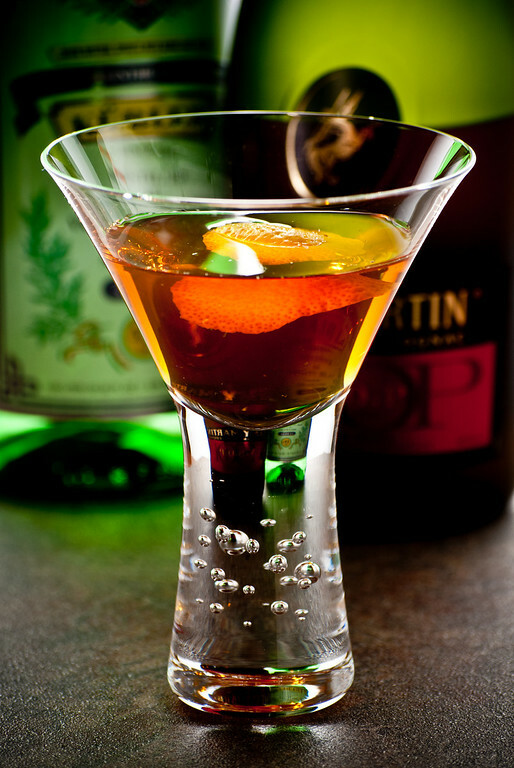 The Bombay works better as a brandy-driven cocktail, with much-reduced proportions of sweet and dry vermouths. Stir with ice until very cold, strain into a chilled cocktail glass. Express and garnish with lemon. Charmingly small, eh? The Bombay works very well as a small drink, one you can finish while it is still very cold. Sweetness is the enemy of this drink—that’s one of the reasons to keep the vermouth proportion low. Even the small amount of Grand Marnier I used here will be cloying if you give it time to warm up. I still don’t have any dasher bottles, so I’m going with a quarter teaspoon; it just works, if it’s cold cold cold. The original recipe calls for “2 dashes” of Curaçao, so it’s pretty clear that Craddock didn’t intend the curaçao to be sweetening the drink; he was, perhaps, balancing an absinthe that was less sweet than the Kübler. * There is, of course, a “Bombay Cocktail (No. 1),” a true obscurity, made with the mysterious and unobtainable “East Indian Punch.” Though just a footnote to cocktail history, it does suggest how the (No. 2), which has no obvious relationship to the flavors of India, could get attached to the name “Bombay.” The East Indian Punch would have given the (No. 1) at least a sensible connection to the “Bombay” appellation; I speculate that it was becoming difficult to source even as Craddock wrote, and so he developed the (No. 2) to keep the Bombay Cocktail name alive. Its more easily sourced ingredients would have let him continue to fill orders, even with the flavors changed. How different is the revised flavor profile? We can’t know, but I’m guessing it’s radically different. So there’s a mystery for historians, to discover what that “East Indian Punch” might have tasted like. “Absinthe and Brandy—The Bombay Cocktail” at http://cold-glass.com : All text and photos copyright © 2011 Douglas M. Ford. All rights reserved. It would be interesting to know what the East Indian Punch was, the above looks like fun, although if I wanted to try it I would have to invest a little more in my liquor. I tend to only keep a couple of things. the photo is brilliant. All are wonderful – the light, the color and the cocktail of course. It gives me a lot of inspiration. I do enjoy doing the photos, it’s always an interesting challenge, as you know. (I commend your website, Science of Drink, to anyone who appreciates good cocktail photography.) Thank you for letting me know, that’s very uplifting to be reminded that people care about these things. Hi, DJ, and thanks for the link—that explains the pleasant (and mysterious) bump in my site visits yesterday! Your Bolaños cocktail looks interesting, can’t wait to give it a try. Don’t flatter me, Doug. I posted it today. Beside, I imagine you get several times more traffic than I do.